(i) A circle is a set of all those points in a plane, whose distance from a fixed point remains constant. (iii) The centre of a circle is that fixed point from which all points remain at a constant distance. (iv) Diameter of a circle is a line segment passing through the centre of a circle, and having its end points on the circle. (v) A chord of a circle is a line segment with its end points lying on the circle. (vi) Interior of a circle is a set of all those points which lie inside the circle. Take a point on your notebook and draw circle of radii 4 cm, 3 cm and 6.5 cm, each having the same centre 0. The given figure shows circles of radii 4 cm, 3 cm and 6.5 cm, respectively. Draw a circle with centre o and any radius. Draw AC and BC two perpendicular diameters of the circle. Join AB, BC, CD and DA. (i) P  lies on the circle. (ii) Q lies in the interior of the circle. (iii) R lies on the exterior of the circle. Take two points A and B on the page of your note book. Draw a circle with centre A which passes through B. Draw a semi-circle with centre O and radius 5 cm. Is the diameter that determines the semi-circle, a part of the semi-circle? The end point of a diameter of a circle divides it into two equal parts, and each part is called a semi-circle. So, it is not the diameter, but end points of the diameter that determines the semi-circle or a part of the semi-circle. The diameter of a circle is 14 cm, find its radius. 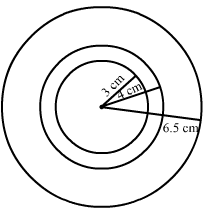 Given a circle with centre O and radius 2.5 cm, what is the length of the longest chord of the circle. (i) The diameter of a circle is ….. times its radius. (ii) The diameter of a circle is the ….. chord of the cirlce. (iii)The diameter of a circle pass through ……..
(v) If join any two points on a circle by a line segment, we obtain...... of the circle. (vi) A radius of a circle is a line segment with one end at ...... and the other end at…..
(ix) The total number of diameters of a circle is ……. (x) Every point on a circle is ……. from its centre. (xi) A chord of a circle contains exactly ……. points of the circle. (xii) A diameter is the longest ……. (xiii) Concentric circles are circles having ……. (i) Every circle has a centre. 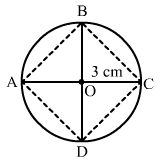 (ii) The centre of a circle is a point of the circle. (iii) Any two radii of a circle make up a diameter. (iv) Every chord of a circle is parallel to some diameter of the circle. (v) A circle is symmetric about each of its diameters. (vi) The diameter is twice the radius. (vii) A radius is a chord of the circle. (viii) Concentric circles have the same radii. (ix) The nearer a chord to the centre of a circle, the longer is its length.